Several observations are worth making. To begin, virtually all of IBM’s $145 billion market capitalization is accounted for by assets in place. This is what you might expect for a mature company that is expected to grow and innovate slowly. Apple is more surprising. The value of the assets in place is greater than the stock market capitalization by $135 billion. This means the market expects Apple will be unable to effectively maintain its current position. In contrast, for Google and Facebook much of the market value is accounted for by growth options. 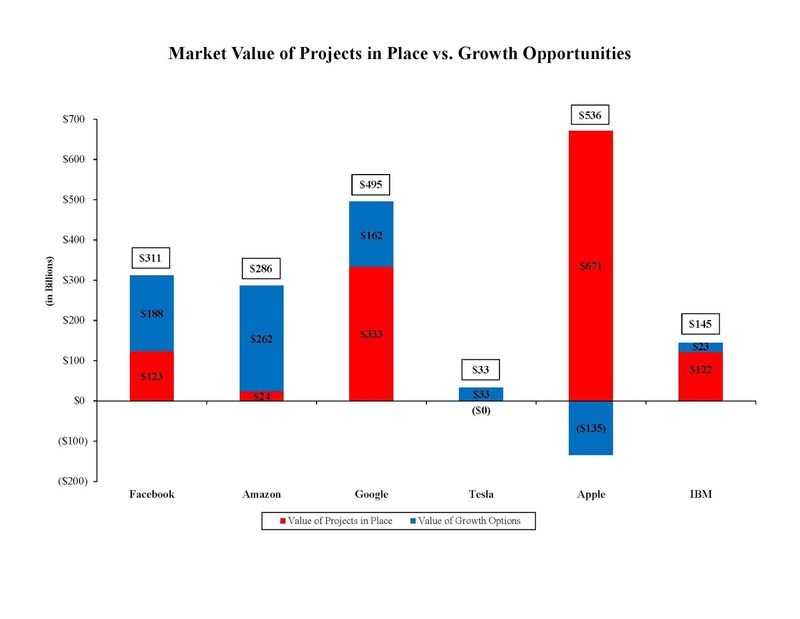 At Facebook, more than 60% of the stock market value is attributable to future innovations that the market expects Mr. Zuckerberg and his team to produce. Finally, at Amazon and Tesla virtually all of the market value is attributable to growth options. That means if the companies fail to deliver on expected innovations, the market values will fall dramatically. Previous PostWhat Mr. Buffett "Understands"
Please visit site. This site is important not only when the owner is selling the business. It is a consideration on tax planning for heirs to the business.